The Bangkok Elevated Road and Train System (BERTS, Thai: โครงการระบบการขนส่งทางรถไฟยกระดับในกรุงเทพมหานคร), commonly known as the Hopewell Project (โครงการโฮปเวลล์) after main contractor Hopewell Holdings, was a failed project to build an elevated highway and rail line from central Bangkok to Don Mueang International Airport. Construction started in 1990, but was suspended by the 1st government of Anand Panyarachun in 1992, and was finally halted by legal acrimony in 1997 with only 10-13% complete. The project was cancelled in 1998. Due to its resemblance to standing stones, it has been comically nicknamed "Thailand's Stonehenge". The 80 billion baht (US$3.2 billion) project was approved on 9 November 1990, without a feasibility study or clear timeline for completion, as a joint project of the Thai Ministry of Transport, the State Railway of Thailand (SRT), and the Thai subsidiary of Hopewell Holdings of Hong Kong. There were to be three phases: the first a north-south line from Hua Lamphong Railway Station, Bangkok's main train station, to Don Mueang International Airport; the second an east-west line from Taling Chan District to Hua Mak; and the third a spur to the port. Totaling 60 km, all three were to be built on top of existing SRT train lines. Rumors of corruption swirled around the project from the outset. The first part of the project was due to be in operation by December 1995, with the rest completed by December 1999. However, construction ceased in August 1997 during the Asian financial crisis, with only around 10% complete. Gordon Wu of Hopewell blamed slow land acquisition on the Thai government, while Thai officials stated that Hopewell had simply run out of money. Both sides demanded financial compensation and threatened to sue the other for breach of contract, with Hopewell claiming the work had cost it US$575 million. The project was formally terminated by the Cabinet in 1998. The project left over one thousand concrete pillars standing idle along the planned routes, described by the Bangkok Post as "a Bangkok version of Stonehenge". Revivals of the project were proposed periodically by both Hopewell and SRT, but were always shot down by the government of then Prime Minister Thaksin Shinawatra. According to an Asian Institute of Technology study, the vast majority of the pillars remain structurally sound and in usable condition, and it has been proposed to use them to build an extension of the BTS Skytrain. Much of the Uttaraphimuk Elevated Tollway on Vibhavadi Rangsit Road parallels the BERTS north-south alignment, with some flyovers since built that obstruct parts of the route. All of the BERTS east-west line's pillars were demolished from 2005 to 2007 during the construction of the Suvarnabhumi Airport Link, which opened to the public in August 2010. The planned SRT Red Lines would cover the rest of the BERTS north-south line, and the project has been described as a "Hopewell revival". A section of the Hopewell structure collapsed onto the main northern line on 1 March 2012. A massive concrete slab 50m by 20m collapsed near Wat Samian Nari temple in Chatuchak district. No injuries were reported. 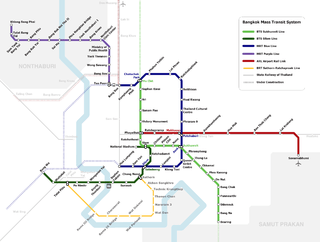 The northern SRT Dark Red commuter Line which will run from Bang Sue to Rangsit started construction in May 2013. The 'Hopewell revival' as some term it, will be an elevated line. Shared tracks or separated tracks for High Speed Rail, DMU/Diesel Tracks, Airport Line extension and Dark Red Line Commuter will eventually be constructed. Though some of the BERTS structures may be used for the Dark Red Line, most will be demolished. Demolition of the pillars on the north-south line started in 2013. Wikimedia Commons has media related to Bangkok Elevated Road and Train System. 1 2 3 4 "Thais Revisit a Troubled Mass-Transit Project", International Herald Tribune, October 10, 1998. Mr. Wu's Hopewell Holdings Ltd. received approval for the project in 1990 without conducting a feasibility study. It began construction before securing ownership of land along the route. Without any clear timetable for completion, Mr. Wu had running public disputes with officials over the speed of construction. Last year, with less than 10 percent of the project completed, the government canceled Hopewell's contract. Thai officials said Mr. Wu had run out of money, while he blamed government instability for slowing land acquisition. Since 1990, Thailand has had one coup and an average of a government a year--besides numerous leadership changes at the Ministry of Transport and Communication. Mr. Wu is threatening to sue the government for breach of contract, and Mr. Akapol said the government would seek compensation for incomplete work. 1 2 3 "Studying the '7-Generation Project'"(translated from Thai), Matichon, June 7, 2001. The Hopewell Project was signed by MOTC (Mr. Montri Phongphanit), SRT and Hopewell (Thailand) Co.Ltd. (Mr. Gordon Woo) on November 9, 1990 during the tenure of the late Montri Phong Phanit (Minister of MOTC), amid controversial rumours of corruption and unusual land deals. Hopewell had to find financial resources (about 80 billion baht - then US$ 3.2 billion) to back up the project for the right to develop real estate along the SRT lines. However, there were so many obstacles to deal with--including blueprints, land transfers, the routes which go parallel to other projects, and a financial crunch--that the project bogged down. There were also many committees dealing with the Hopewell project.... After September 1997, Mr. Suwat Liptaphallop (MOTC Minister during the Gen. Chawalit Yopngjaiyut government) sent the issue of the project delay to the cabinet and Mr. Suthep Thueaksubun decided to terminate the project in 1998. Even though several groups offered to revive it, controversies still haunt the project, earning it the nickname "the 7-generation project." ↑ "Thaksin halts SRT's plan to revive Hopewell project," Business Day, September 28, 2001, by Siriphan Pongthanee. Prime Minister Thaksin Shinawatra has turned down the State Railway of Thailand's (SRT) proposal to revive the Hopewell project, and ordered the agency to cut back on future investment. ↑ "Reviving the former Hopewell route", translated and summarized by Wisarut Bholsithi from Prachachart Thurakij, March 4–7, 2004. ↑ "Hopewell section crumbles". The Nation. 2 March 2012. Retrieved 17 June 2013. ↑ "Hopewell's pillars ousted by Red Line". Bangkok Post. 1 February 2013. Retrieved 27 May 2013.